The "fountain effects" which surrounded his station are not responsible for the ever-growing power observed by Tesla. This was the result of an incoming aetheric supply for which his Transmitter gave low-resistance passage. The incoming aetheric flow preferred the transmitter terminal to adjacent, more resistant rock. This gradual flow process soon evidenced itself in magnification effects, ever increasing volumes of flowing aether being measured in his system. Some have argued that Tesla merely stored energy in the earth, extracting it for use later. This is a basic error, the result of imagining the Colorado Springs experiment to be one consisting entirely of electrical effects (Grotz). It is in this light alone that we may comprehend the evident anomalous magnification of aetheric phenomena in his Colorado Springs photographs. Once aetheric energy had been obtained from space, it had to be conveyed to consumers. 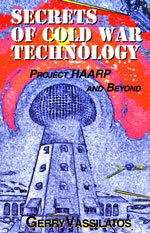 Tesla had arranged for the automatic activation of aether-rebroadcast circuits in the station. The down pouring aether was automatically shunted to side circuits through capacitors. In these side branches, aether pulsed through dielectrics and expanded over the surfaces of his smaller coils. Thus stimulated to more rapid pulsation rates, they were ready for "rebroadcast". Being rebroadcast away from the station through large vacuum globes, poised on elevated platforms, these were the aetheric pulsations, which would be utilized in home and industry. Simple and compact receivers would be established in every home and factory, set to receive aetheric current through the ground. Tests were thrilling. The distant appliances, lamps and motors responded to the powerful pulsations, as if they were physically connected to the station by wire. A small house-like structure was established some 26 miles away from the station. In it, an aetheric power receiver was tuned to one of the rebroadcast rates. The 200 lamps housed within this structure, each of 50 watts rating, all remained brilliantly illuminated throughout the test runs. This apparently stimulated enough excitement and concern for word of this development to get back east. Engineers were enraged. Those who had missed his most early shift from alternations to impulses, failed to comprehend the vast distinction between "stationary waves" and " standing waves". The quizzical use of specific terms such as these was a Tesla trademark, one designed to puzzle the minds of those who criticized him the most. With the exception of a very few colleagues who continually made related discoveries in aether physics, most academes had chosen to remain totally ignorant of the new study area. This for example was the case with the Teslian use of the term "frequency" and of "resonance" words which had completely different meanings for Tesla. Teslian "frequency" refers to the repetition of pulses per second. Teslian "resonance" refers to conditions in which aether flows with little or no resistance through systems, whether proximal or widely separated. Photographs, which Tesla sent to his "financiers", were analyzed and reexamined repeatedly for their encrypted meaning. None could decipher the cunning puzzle which Tesla had set before them. Tesla stated that photographs of the aetheric white fire streamers required several minutes' exposure time before registering the faintest sort of impression. Most of the plates were therefore the results of more than 20 minutes' exposure time. There are a very few plates which, though stated to be the result of "one brief switch closure", are covered with dense, thick white streamers. One fraction of a second closure on the system switch resulted in a twenty-minute or more aether avalanche. Magnifying Transformers continued discharging long after the initial impulse had been withdrawn. Tesla returned to New York exultant. He was about to establish a new world precedent. Venture capitalists were everywhere, looking for their opportunity to enter the "new energy" market. 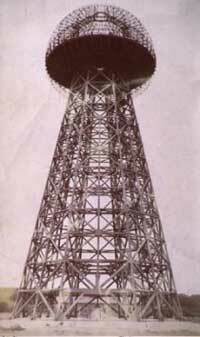 Unknown to Tesla, his station, its tower, the large coils, the capacitors, and all the other marvelous apparatus, which demonstrated free aetheric power to the world, had been acquired for demolition. Tesla simply went forward, securing new funds from Morgan and others toward the development of a fully functional industry sized station in Long Island. Wardenclyffe would be his greatest achievement. Here he would broadcast power to the world, along with a communications network, which could span the globe with innumerable available channels. Several stations would augment the power of this first station, from which he proposed to rebroadcast 10,000horsepower. The Station, a wonderful visionary structure, which dominated the view of Shoreham, Long Island, was not quite complete before it too was seized by court injunctions and torn down. Tesla was summoned to appear in court. Mr. Leland Anderson who has since published a wonderful treatise with this transcript as the centerpiece has secured the amazing transcript of this proceeding. Tesla said he wept when he saw the ruined tower at Wardenclyffe (image right). The train ride back from Shoreham was filled with tears and the recounting of every tragedy, which marked his life. But the dreams did not die there. In the absence of financial means to construct his gigantic stations, Tesla found ways to build small systems, which accomplished the very same objectives. Replacing the large overhead capacity terminal with material substitutes, radioactive metals in combination with other dense elements, Tesla was able to accrete and focus aether pulsations of super short duration. Tesla was then plunged into a hellish time, where all but one would neither help nor hear him. Dr. John Hammond requested Tesla to be the permanent guest on his family estate. There, amid the family life of Hammond Castle, Tesla shared his dreams and technology. Together, he and Dr. Hammond developed the science of robots and remote guidance. Tesla, impoverished by the inhuman treatment wrought on him by the financial establishment, was nonetheless quite alive and valuable to those having singular ambition to dominate the world radio trade. For a very long time, Nikola Tesla was considered "out of circulation." But later years turned a kindlier edge toward him. Long after his principle foe had died, other sought him out. Employed by the Rockefellers in their RCA venture, Tesla was given the task of restructuring the now failing Marconi System. David Sarnoff did not permit Tesla the dignity of working under his own name! Nevertheless it was Tesla, not Sarnoff, who redesigned the insufficient RCA radio systems to sufficiently turn a profit for the owners. It is significant that Tesla was not allowed to change the basic design from wave radio to radiant communications. What he achieved required certain strange conversions within the wave radio circuitry, intensifying radiant signals until the operation was much improved, and then converting the amplified signals back to waves once again. All of this was achieved within the chassis, certain of which are now being studied. These Tesla experimental models are typical of the Tesla style, containing no resistors or other such components. These models use simple transmitter tubes and employ a great number of symmetrically disposed conical air coils. While working for RCA under the name "Terbo", his mother's maiden name, Tesla maintained his two penthouse suites atop the Hotel New Yorker. One penthouse was his living quarters, the other a full-scale research laboratory. Tesla designed and built small compact and portable aether energy receivers, a developmental path, which he pursued to his passing. Tesla had long investigated the use of pure dielectric field energy, a stream of aether whose individual pulsations were so very ultra short that science had never found a means to harness the energy impulses. 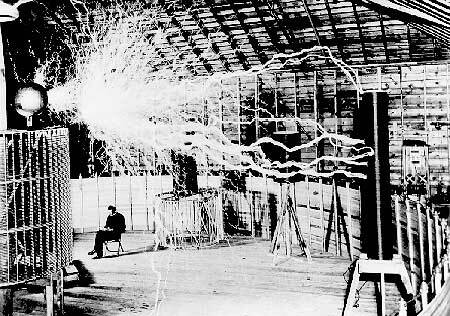 Tesla later held the opinion that dielectric current was composed of radiant particles, aetheric in nature. He therefore sought natural sources in which native dielectric fields could be used as they were, without the need for mammoth voltage "shocks" to stigmata aetheric currents. Tesla knew that if dielectric aether streams could be directly engaged, a true world of the future would be in his grasp. Furthermore, the mass-production of thousands and ten thousands of such power receiver would be an unstoppable army. An army of miniatures, which could never be torn down. The implications were fathomless. Tesla had found a truly new and wonderful approach to an old problem. Once because his technology had not yet grown to the level where this was possible, he had to settle for impressing the naturally prolific aether streams with "extra" pulsations. The Transmitter method was costly, gargantuan, and an easy target for those who hated the notion of a future world where dreams rule humanity. Dielectric energy fascinated Tesla. It was everywhere, a natural emanation whose potentials far out proportioned conventional notions of power. Indeed, the early conception of natural radioactivity as an energetic source was nothing in comparison to the potential power inherent in dielectric streams. The new technology would use ultra-short pulsing aether streams, energies that occupied most of his latter press conferences in latter years. Study had convinced Tesla that the apparently smooth and native force characteristic of dielectric field energy was actually a particulate flux, a succession of ultra-short impulses. Of a truth, dielectric energy was native source of incredible proportion and virtually eternal duration. Able to use such a kinetic source, one could dispense entirely with the Power Transmitters necessary in stimulating and impressing "extra pulsations" on the aether flow. Tesla often defined the dielectric field as a natural flow of aether particles, one that seemed impossible to utilize through lack of appropriate resistive materials. In order to obtain momentum from the flowing particles of a dielectric field, one required special matter poised in equally special symmetries. The otherwise continuous flow could be absorbed directly, being exchanged to utilities, appliances, and other applications. Tesla had already considered the condition of charged particles, each representing a tightly constricted whorl of aether. The force necessarily exerted at close distances by such aetheric constrictions was incalculably large. Aetheric ponderance maintained particulate stability. Crystalline lattices were therefore places within which one could expect to find unexpected voltages. Indeed, the high voltages inherent in certain metallic lattices, intra-atomic field energies, are enormous. The close Coulomb gradient between atomic centers are electrostatic potentials reaching humanly unattainable levels. By comparison, the voltages, which Tesla once succeeded in releasing, were quite insignificant. In these balanced lattices, Tesla sought the voltages needed to initiate directed aetheric streams in matter. Once such a flow began, one could simply tap the stream for power. In certain materials, these aether streams might automatically produce the contaminating electrons, a source of energy for existing appliances. One could theoretically then "tailor" the materials needed to produce unexpected aetheric power with or without the attendant detrital particles. Tesla did mention the latent aetheric power of charge forces, the explosive potentials of bound aether, and the aetheric Power inherent in matter. In these studies, Tesla sought replacement for the 100,000,000 volt initiating pulses which natural law required for the implementation of space aether. Tesla had long been forced to abandon those gigantic means by other, less natural laws. Thereafter, Tesla shifted his attentions from the appreciation of the gigantic to an appreciation of the miniature. He sought a means for proliferating an immense number of small and compact aether power receivers. With one such device, Tesla succeeded in obtaining power to drive an electric car. But for the exceptional account, which follows, we would have little information on this last period in Tesla's productive life, one that very apparently did not cease its prolific streams of creativity to his last breath. The information comes through an unlikely source, one rarely mentioned by Tesla biographers. It chanced that an aeronautical engineer, Derek Ahlers, met with one of Tesla's nephews then living in New York. Theirs was an acquaintance lasting some 10 years, consisting largely of anecdotal commentaries on Dr. Tesla. Mr. Savo provided an enormous fund of knowledge concerning many episodes in Tesla's last years. Himself an Austrian military man and a trained aviator, Mr. Savo was extremely opened about certain long-cherished incidents in which his uncle's genius was consistently made manifest. Mr. Savo reported that in 1931, he participated in an experiment involving aetheric power. Unexpectedly, almost inappropriately, he was asked to accompany his uncle on a long train ride to Buffalo. A few times in this journey, Mr. Savo asked the nature of their journey. Dr. Tesla remained unwilling to disclose any information, speaking rather directly to this issue. Taken into a small garage, Dr. Tesla walked directly to a Pierce Arrow, opened the hood and began making a few adjustments. In place of the engine, there was an AC motor. This measured a little more than 3 feet long, and a little more than 2 feet in diameter. From it trailed two very thick cables, which connected with the dashboard. In addition, there was an ordinary 12-volt storage battery. The motor was rated at 80 horsepower. Maximum rotor speed was stated to be 30 turns per second. A 6-foot antenna rod was fitted into the rear section of the car. Dr. Tesla stepped into the passenger side and began making adjustments on a "power receiver" which had been built directly into the dashboard. The receiver, no larger than a short-wave radio of the day, used 12 special tubes, which Dr. Tesla brought with him in a box-like case. Mr. Savo told Mr. Ahler that Dr. Tesla built the receiver in his hotel room, a device 2 feet in length, nearly 1 foot wide, a 1/2 foot high. These curiously constructed tubes having been properly installed in their sockets, Dr. Tesla pushed in 2 contact rods and informed Mr. Savo that power was now available to drive. Several additional meters read values, which Dr. Tesla would not explain. No sound was heard. Dr. Tesla handed Mr. Savo the ignition key and told him to start the engine, which he promptly did. Yet hearing nothing, the accelerator was applied, and the car instantly moved. Tesla's nephew drove this vehicle without other fuel for an undetermined long interval. Mr. Savo drove a distance of 50 miles through the city and out to the surrounding countryside. The car was tested to speeds of 90 mph, with the speedometer rated to 120. After a time, and with increasing distance from the city itself, Dr. Tesla felt free enough to speak. Having now become sufficiently impressed with the performance of both his device and the automobile. Dr. Tesla informed his nephew that the device could not only supply the needs of the car forever, but could also supply the needs of a household "with power to spare". When originally asked how the device worked, Tesla was initially adamant and refused to speak. Many who have read this "apocryphal account" have stated it to be the result of an "energy broadcast". This misinterpretation has simply caused further confusions concerning this stage of Tesla's work. He had very obviously succeeded in performing, with this small and compact device, what he had learned in Colorado and Shoreham. As soon as they were on the country roads, clear of the more congested areas, Tesla began to lecture on the subject. Of the motive source he referred to "a mysterious radiation, which comes out of the aether". The small device very obviously and effectively appropriated this energy. Tesla also spoke very glowingly of this providence, saying of the energy itself that "it is available in limitless quantities". Dr. Tesla stated that although "he did no know where it came from, mankind should be very grateful for its presence". The two remained in Buffalo for 8 days, rigorously testing the car in the city and countryside. Dr. Tesla also told Mr. Savo that the device would soon be used to drive boats, planes, trains, and other automobiles. Once, just before leaving the city limits, they stopped at a streetlight and a bystander joyfully commented concerning their lack of exhaust fumes. Mr. Savo spoke up whimsically, saying that they had "no engine". They left Buffalo and traveled to a predetermined location, which Dr. Tesla knew, an old farmhouse barn some 20 miles from Buffalo. Dr. Tesla and Mr. Savo left the car in this barn, took the 12 tubes and the ignition key, and departed. Later on, Mr. Savo heard a rumor that a secretary had spoken candidly about both the receiver and the test run, being promptly fired for the security breach. About a month after the incident, Mr. Savo received a call from a man who identified himself as Lee DeForest, who asked how he enjoyed the car. Mr. Savo expressed his joy over the mysterious affair, and Mr. DeForest declared Tesla the greatest living scientist in the world. Later, Mr. Savo asked his uncle whether or not the power receiver was being used in other applications. He was informed that Dr. Tesla had been negotiating with a major shipbuilding company to build a boat with a similarly outfitted engine. Asked additional questions, Dr. Tesla became annoyed. Highly concerned and personally strained over the security of this design, it seems obvious that Tesla was performing these tests in a desperate degree of secrecy for good reasons. Tesla had already been the victim of several manipulations, deadly actions entirely sourced in a single financial house. For this reason, secrecy and care had become his only recent excess.